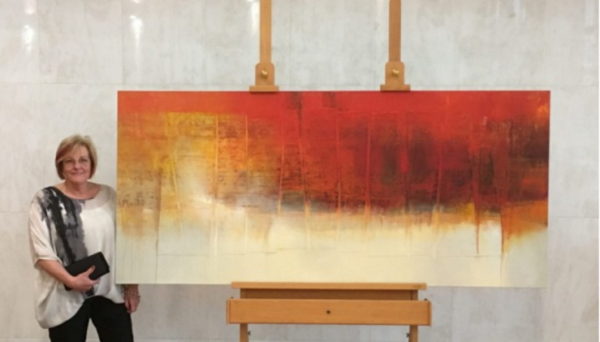 NZ Abstract Artist Bee Doughty-Pratt’s painting ‘Fractured Light’ was a farewell gift for Governor General, Sir Jerry Mateparae. Sir Jerry Mateparae, and his wife, Lady Janine Mateparae had this serene painting installed in their Kapiti home. Otaki artist Bee Doughty-Pratt with her painting ‘Fractured Light’, given to departing Governor-General Sir Jerry Mateparae as a farewell gift. NZ Abstract Artist Bee Doughty-Pratt painted ‘Fractured Light’ which was given to departing Govenor General Sir Jerry Mateparae, now if you are looking at this abstract painting and searching for meaning, reading the title(s) is always a good place to start. With ‘Fractured Light’ before knowing the title it may look completely abstract and void of content. However, once the title is considered two things can be discerned. Firstly, strips are fracturing the surface, where light does and does not bleed through. Secondly, the orientation and hint of a horizon allude to a landscape, but not of hills, sea or lake, but for the way light is fractured by the surroundings. The strips begin to take on the form of a visual metaphor; Stand-ins for trees, or if one were laying down in the grass, looking up as the sun sets. Illuminating the blades with the warm light of the sun and in the distance seeing the night sky creep from below. That is part of what makes Bee’s work so immersive; because it captures essence rather than in real life detail such as grains of sand or blades of grass. It creates a landscape in the mind, not of place, but feeling. Bee’s paintings are successful because of how she understands the consequences and effects of colour and paint application. The mastery of those is crucial in being able to create stunning artwork which is so sought-after. Bee often works on multiple paintings at one time, moving across the surfaces, letting the brush and paint capture and hold movement. The gestures, textures, colours and blending, have them falling in and out of abstraction, forms and horizons appear and disappear. Rather than painting that which everyone sees, Bee interprets a scene and represents it with colour and gesture to convey its essence, igniting an experience or feeling in the viewer that would potentially go untriggered. From the familiar beachside seascape to glimpses of waves or gestures that capture the movement of crashing water. For Bee, capturing the essence of what she experiences and sees has more importance than representing every detail of what she saw. Bee uses titles to communicate what inspired the artwork; it is clear that Bee paints from a love of landscapes and takes pleasure in creating them. Her love of painting even extends to the mundane washing of brushes.